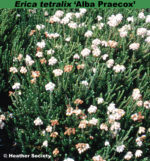 White flowers, VI–X; grey-green foliage; height 21–25cm; spread 31–45cm. The foliage is less grey than 'Alba Mollis'. In cultivation by 1789 (see under E. tetralix var. alba). Named from albus = white; after the flower colour. White flowers, VI–VIII; greyish foliage; height 21–25cm; spread 31–45cm. Blooms earlier than 'Alba Mollis' and has less striking foliage. White flowers, V–VIII; silver foliage; height 21–25cm; spread 31–45cm. One of the earliest to bloom. Wild-collected; found at Bartinney Downs near Land's End, Cornwall, England, by Neil Treseder before 1972; introduced by Treseders Nursery (Truro, Cornwall) before 1972. Name after the place where it was collected, Bartinney Downs, near Lands End, Cornwall. White flowers aging to pale pink, VI–X; silver-grey foliage; height 21–25cm; spread 31–45cm. Named after the Dee river in Wales. White flowers, VI–X, profuse; dark green foliage; compact; height 10–15cm; spread 26–30cm. Found near Uig, Isle of Lewis, Scotland. Flowers single, calyx yellow, corolla white: VI-VIII: foliage bright green: habit spreading: height 20cm: spread 40cm. Found as a seedling, by Mr Nicol in July 1984 at MarkHill, Glenapp, Ballantrae, Ayrshire, Scotland, and named after his wife. Registered 1 November 1995: Robert D. W. Nicol, Stranraer, Wigtownshire DG9 OBG. White flowers, VI–X; silver-grey foliage; neat compact habit; height 21–25cm; spread 26–30cm. Wild-collected; found on Melbury Common, Devon, England, by 1966; introduced by Treseder's Nursery (Truro, Cornwall). Named after the locality in north Devon where it was collected. White flowers, VII–IX; grey-green foliage; compact habit; height 21–25cm; spread 31–45cm. Introduced by N. R. Webster (Glencairn, Elgin, Scotland) in 1959. Name possibly alluding to the flower colour.